with the copy of your shopping cart. 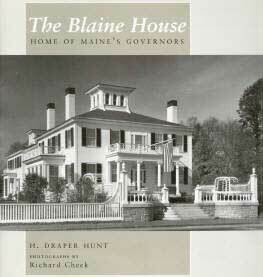 The Blaine House is not only home to Maine's Governors and their families, it is also a public building. As such, it is subject to constant use. While basic upkeep of the building is taken care of by state government, there are many aspects of maintaining the Blaine House and its grounds that require private funds. The non profit organization, "Friends of the Blaine House", was formed to maintain, repair, and/or replace items such as draperies, rugs, upholstery, dinnerware, and furniture as well as the seasonal planting and care of the gardens. Thank you for supporting the work of the "Friends of the Blaine House" by purchasing this ornament. Ornament measures approximately 3" in width and 1 5/8" in height. Inscription at the bottom: "The Blaine House 1833, Augusta, Maine". In 1972 Phyllis Siebert became the cook at the Blaine House, the home of Maine's Governors. Through 5 administrations, she has creatively and energetically pursued her role as chef and caregiver. R&R is a self portrait of Phyllis set at against personalities and events of the last 25 years of the State's Political History. Enjoy 200 pages and illustrations and great advice about great Downeast Cooking. 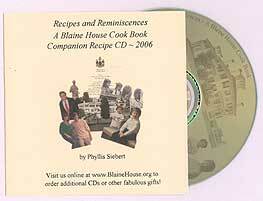 This disk has been created to compliment the original printing of Recipes and Reminiscences. 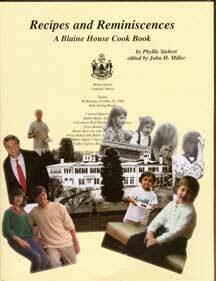 It however can be used alone as a truly unique collection of 256 recipes and several memoirs of Phyllis Siebert, Blaine House Chef. $10.00 - Special Internet Only Price! Since 1862 Maine's most celebrated residence has functioned as both a home and a political nerve center. When the family donated it, the tradition has remained intact. Over the years governors and their families have benefited and appreciated its political value and have given the personal dimension to the history of this National Historic Landmark. 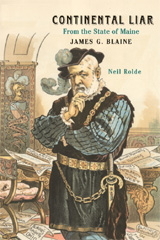 This is the fascinating biography of a man who dominated the American political stage, starting just before the Civil War and continuing almost until the twentieth century. He was twice U.S. secretary of state, credited with having started our country on the path to acting like a world power, a powerful speaker of the house in Congress, and a United States senator from his adopted State of Maine. Author: Earle G. Shettleworth Jr. The Blaine House in Augusta is one of Maine’s most notable homes. In 1862, three decades after the house was built by Capt. James Hall in the early 1830s, James and Harriet Blaine moved in. The home became the setting for one of the most meteoric careers in American politics, during which James Blaine served as Speaker of the US House of Representatives, US senator, secretary of state, and Republican candidate for president in 1884. After the deaths of her parents, the Blaines’ daughter Harriet Blaine Beale gave the house to the state in 1919. Since 1920, it has served as the official residence of the state’s governors and their families. As a symbol of state government, it ranks with the Maine State House. The house has been a National Historic Landmark since 1964. Architecturally, it reflects a combination of Federal, Victorian, and Colonial Revival styles. Today, the Blaine House functions as a social showcase for Maine, a working office, and family living quarters. Author Bio: Earle G. Shettleworth Jr. has served as the director of the Maine Historic Preservation Commission since 1976 and as Maine’s state historian since 2004. He has coauthored or authored eight other Arcadia publications.